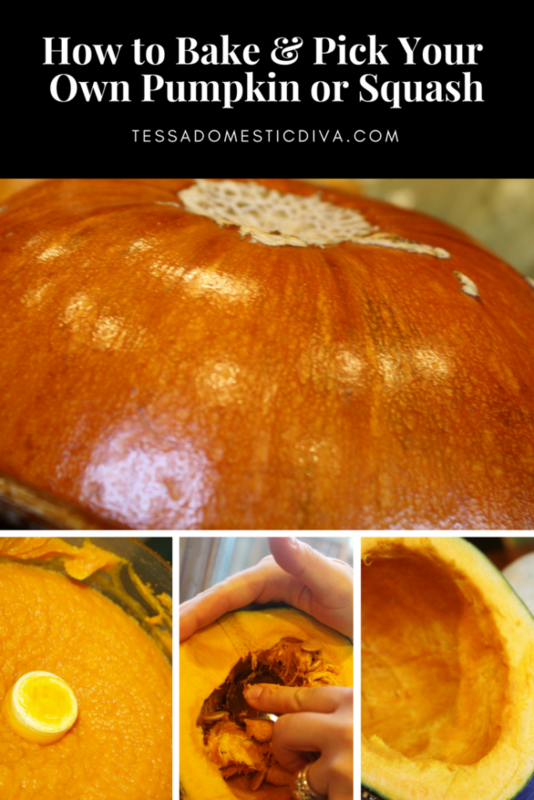 Baking your own squash or pumpkin couldn’t be any easier, and the taste and texture results are so worth it!! As an added bonus, you save some money, perfume your house with pumpkiny goodness (I know..not a word! ), and most likely put to use a item you likely had out for some pumpkin or fall decor anyways. 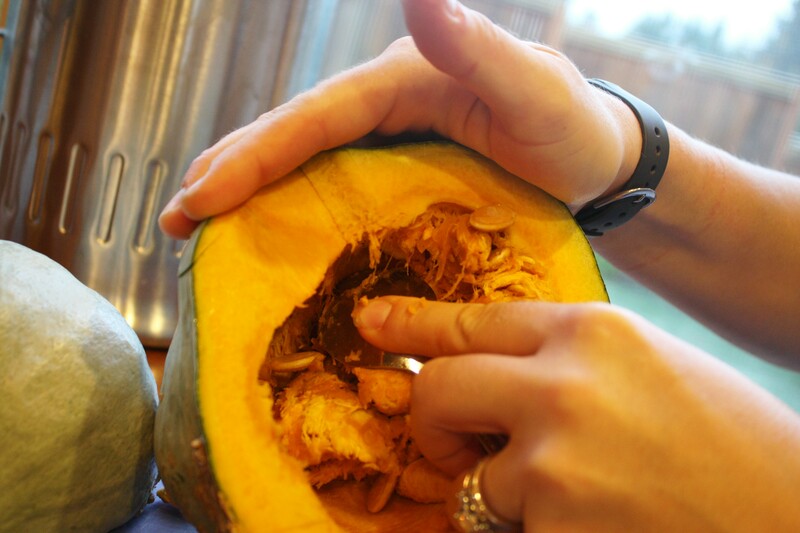 Here are some simple directions to get some very tasty pumpkin puree, and some tips on how to store it. Which pumpkins to bake? Not all pumpkins are intended for consumption. The typical jack-o-lantern we purchase for Halloween is very watery and lacks flavor. 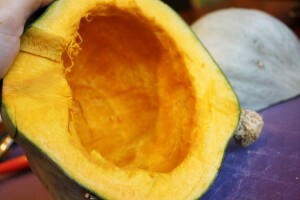 Ask at the market or store you buy from if you need help finding a good cooking squash. My favorites are : Buttercup, Kabocha, Butternut, Cinderella, Fairytale, Carnival, Long Pie, Hubbard, Sweet Meat, Chioggia, Galeux D’Eysines, and Sugar Pie (although there are endless options out there!). Sugar Pies and Butternuts are the most widely available. They key to picking a good one is choosing a GOOD EATING variety, then it needs to feel dense and hefty for it’s size….a sign of good flesh! Ask your local farmer or produce person for help. When in doubt, choose a Sugar Pie or Butternut. HAVE A FUN BAKE-OFF DAY: Stock up on a few varieties for a little taste test, find out which you like best!! Some are much sweeter than others! It is just as easy to fill two cookie sheets as it is 1, take advantage, it will save you some time and energy! 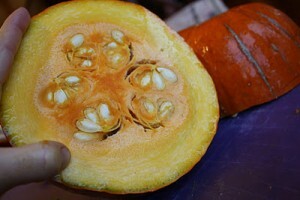 The water content of every squash can vary widely. One year, my normally perfect Cinderella Pumpkin was super spongy and watery (I think it cross pollinated with some other varieties). When I baked it, there were pools of water. I had to hassle with cooking the water out of it…fine, but kind of a pain. In general, stay away from any spongy or overtly soft pumpkins – too much water! Flesh should be very firm with little give when pushed. Some squashes are very dry, so it is OK to add some water to the final flesh to puree it to desired consistency. You are going for smooth and easily scoopable, but you should not be able to easily pour it. If you have ever opened a can of pumpkin, you know what you are looking for. How much will I get? Typically, a Sugar Pie will yield about 2 cups pumpkin puree. But that is a gross generalization,,,the size can vary widely! I baked one good size Sugar Pie and one melon size Kabocha here (see pictures below) and filled about five two-cup bags of puree. 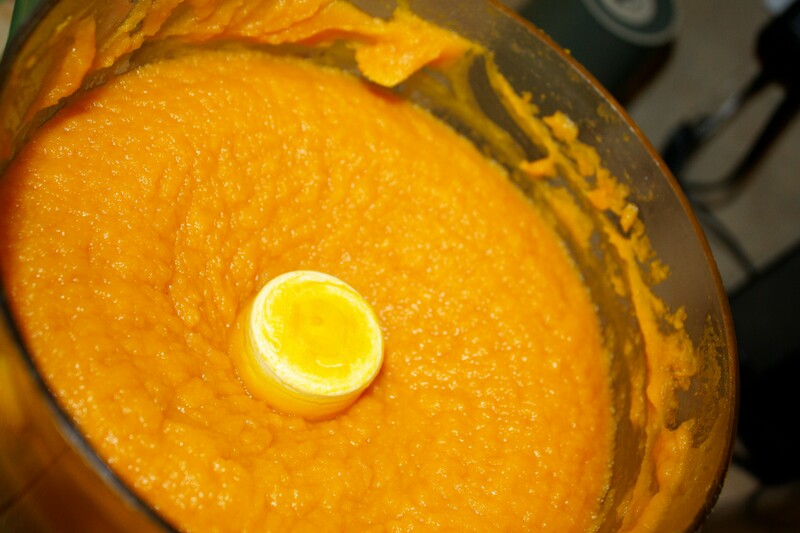 To save on time, I like to cook large varieties so I get loads of puree in one fell swoop! INSTANT POT? With the addition of this beloved tool into my kitchen, I now regularly use this to cook my pumpkin and squash for puree, s quick!! Simply clean as below and cut pieces to fit onto the steamer trivet. I start with about 15 minutes on the ‘Manual’ function, but it will depend on the size and thickness of the variety you are using. Add more time if you need. Cut your squash into half, or if it is a large pumpkin, into large chunks that will fit onto a cookie sheet. Use large knife, this can take some muscle. Using a large metal spoon, scrape away the innards, and if you are feeling especially ambitious, set the seeds aside to to be washed and roasted! Here we have it cleaned out and ready to bake, or cut to fit into an Instant Pot..
Place the squash cut side down on a cookie sheet. If you are using an especially dry squash, adding a couple of tablespoons water to the pan is OK. Place the sheet into a preheated 350 degree oven. OR if using and Instant Pot, cut pieces to fit into the Instant Pot on top of the steamer trivet. Cooking time will vary greatly on the size of squash you are cooking. First test is to pierce the outer skin with a fork, it should be easy. Second, lift one of the pieces up and probe around the inside, the flesh should fall away easily w/ almost no scraping. If it still seems firm, you know you need some more time. Start with about 45 minutes for an average size sugar pie pumpkin. Mine were large and took about an hour. I have had to go up 80 minutes before. 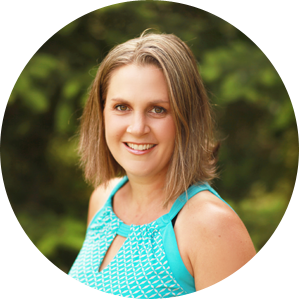 If you are using and Instant Pot, start with 15 minutes on the manual setting! Once the cooked flesh is cool enough to handle, scoop it out into a food processor (I LOVE mine and can’t live without it!). Whir the whole mixture for a couple of minutes until silky and smooth. With my Kabocha squash, I had to add a touch of water to give movement to the flesh within the food processor bowl. The Sugar Pie had more water content and needed no additional water to spin freely. 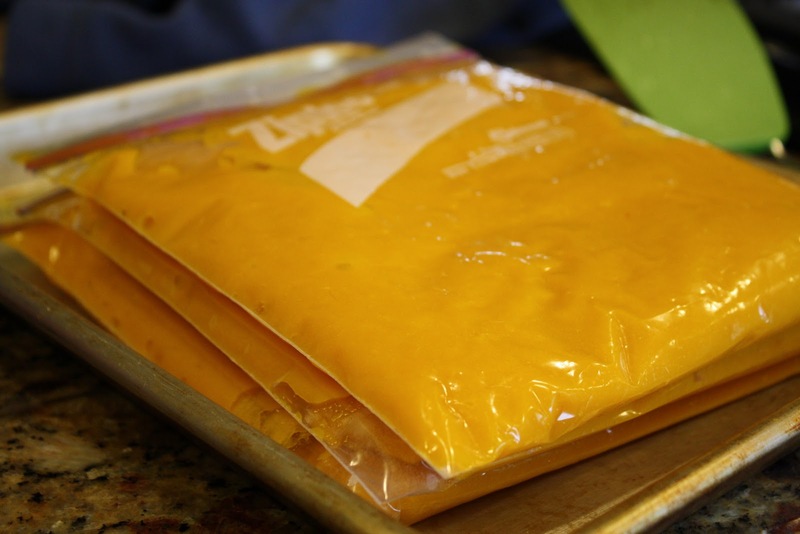 One idea for storage is to put measured amounts (I suggest 1 or 2 cup portions) in freezer safe Ziploc bags. Squeeze the excess air out, and squish it around to lay it flat. I stack my bags and freeze them like this. When they are frozen flat like this, it is very easy to stack or ‘file’ them into the free space in my freezer. I also freeze the puree in mason jars (careful to allow an inch or 2 for expansion). I just started making my own puree this year. The first ” sugar pumpkin” I purchased came out tasting like sweet butternut squash and mashed beautifully. The next “sugar pumpkin” came out like spaghetti squash and looked and tasted like an orange spaghetti squash. I made it into a puree , but it was weird. Hi Judee! It looks like you either got a a pumpkin that was mislabeled (most likely), or just a bad one. 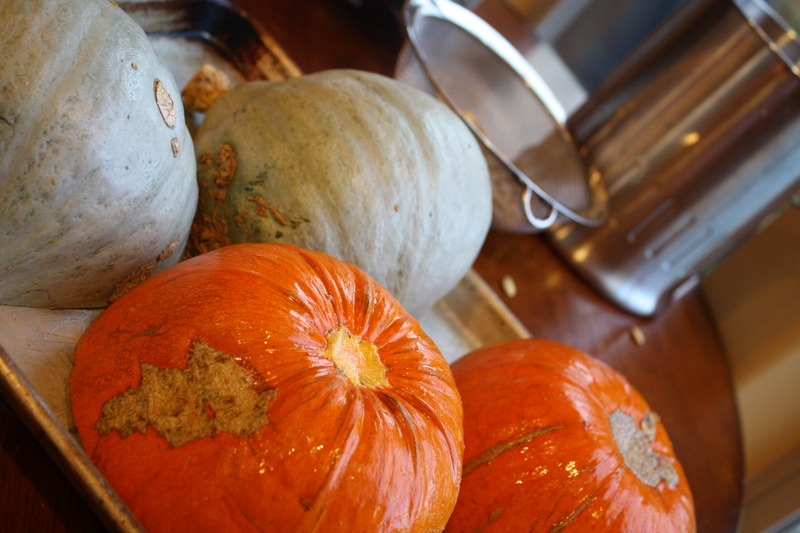 Just like apples, even in season aren’t always great, sometimes you get not so great/flavorful pumpkins and squash. I have taken to stalking up when I find a supplier with tasty ones…and lately I have been going for all sorts of large heirloom varieties because I can get so much puree from one fruit, it saves a lot of energy (buttercup, blue doll, kabocha, and hubbard, and other varieties I find). I used to think this was totally unnecessary…WAY easier to buy pumpkin in a can. In Tessa’s pumpkin bar recipe, she swears up and down that fresh pumpkin is undeniably better. I had to “taste test” the recipe both ways (oh darn, pumpkin cake twice)to see for myself. Not only was I pleasantly surprised that it really is quite easy to bake your own pumpkin but it really does taste better! I also used fresh pumpkin puree in a pumpkin soup I made and it rocked. I totally get what she means about the canned pumpkin having a stronger taste so I definitely recommend fresh! Hi, If I were making pumpkin pie, which pumpkin should I be using to make the puree from?? Thx for this post! Y, be it squash or pumpkin! Great Tutorial! Thank you so much for sharing with Full Plate Thursday and hope your weekend was great! 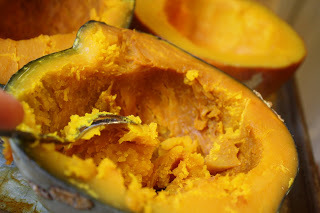 Great pics and tutorial on cooking squash. I love the idea of cooking up some extra and freezing it for quick use in the future. I am about to do this tomorrow, so thanks for the tips! Perfect for linking up on Tuesday Greens! Thank you for such an easy pumpkin tutorial! I love pumpkin, but am so hesitant to chop one up myself. Pinnimng this post!